This new tuning tool belongs to the “BlackPed” product family (www.blackped.com). The most important basic function of the RedPed module is the adjustment of the engine support from 15 to 75 km/h - by the way, with correct speed indication in the E Bike Display. Another interesting feature is the logbook for (optional) every ride in connection with the app and many other fine adjustment possibilities for your E Bike (e.g. the wheel circumference). 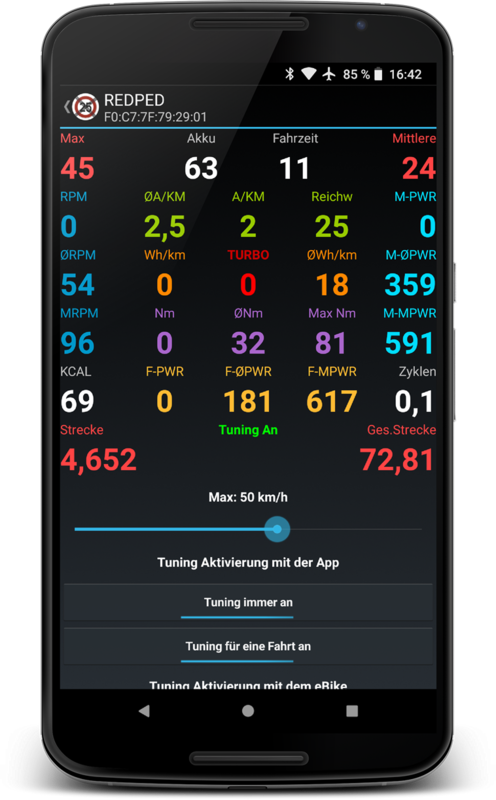 For practical reasons RedPed offers two speedometer views on the smartphone: "Easy" and "pro". Depending on the operating system and the motor variant, up to 25 values can be read live on the smartphone. You can also set the activation code for the RedPed yourself: This allows you to safely activate or deactivate the tuning on your electric bike without using your smartphone. You can also define the Bluetooth visibility between the module and the smartphone in the app. In summary, it can be said that the RedPed module is a more advanced version of the popular BlackPed+ module with many improvements and, very important, correct speed indication on the E Bike display. In addition, the RedPed module has many other functions, making it probably the most powerful E Bike tuning product of all. 25: Counter that counts how often the Walk key was pressed, turns green when the set number is reached, there is a separate counter for 21 to 24. - 1 RedPed module (manufacturer: BlackPed), each one selectable for one motor system. 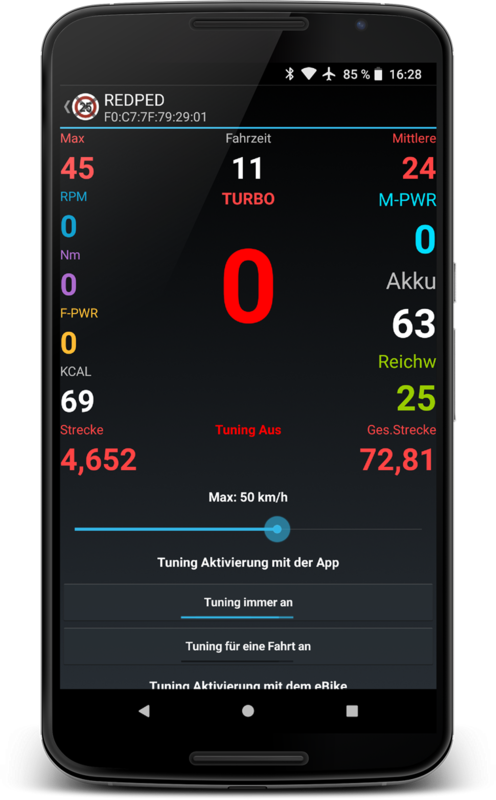 - 1 manual for the app as PDF for download: EBT_Anleitung.pdf. - The respective instructions for the different motor types can be found in video format on the product pages. - 1 Smartphone App for Android or iOS available in the corresponding App Stores.